Megan Elias is a historian and gastronomist whose work and research explores the rich history of food and culture through prisms of food writing, markets, and home economics. 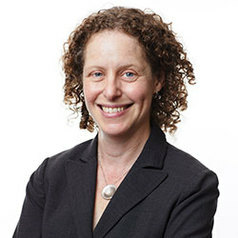 She has taught at Queensborough Community College, worked in administration at the Borough of Manhattan Community College, and was the director of online courses at the Gilder Lehrman Institute of American History. In addition to developing curricula and producing online courses, Dr. Elias has designed and taught classes in the areas of food studies, food in world history, American women’s history, and African-American history. Elias is the author of "Food on the Page: Cookbooks and American Culture" (2017) as well as four other books about food history, including "Food in the United States, 1890–1945," which was selected by the American Library Association as an Outstanding Academic Text for 2009. She is the author of articles and book chapters about food history, and serves as an editor for Global Food History Journal. She has been a co-recipient of several grants from the National Endowment for the Humanities, among other organizations.